The "D" class destroyers weretypical of the whole series of successive classes from A to I built for the R.N. in the 1930's. In general these were economy designs and tended to be smaller and less well armed than destroyers of other major foreign powers. H.M.S. Daring was commanded by Lord Louis Mountbatten in 1934. She was torpedoed by a U boat on the 18th February 1940 off Duncansby Head Scotland. Daring was launched by Thornycroft in 1932 on a Displ of 1.375 tons. Her main weapons were 4x 4.7" guns and 8 x 21in torpedo tubes, with geared turbines on 2 shafts giving 36,000 s.h.p. and a top speed of 36 knots. When placed along side the V & W in our range, this shows how the destroyers progressed in the 1920/30's. 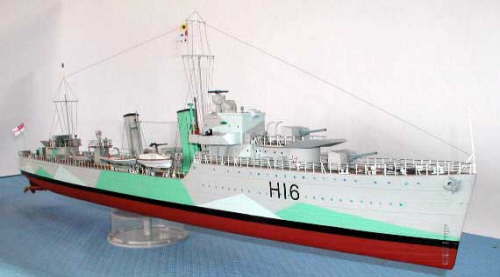 This model is based on a plated glass fibre hull, with the superstructure and decks in 1mm plastic. Vac-forms for the funnels, boats, etc, cast alloy main weapons and close range armament. To add the final crisp finish to the model, brass etchings are supplied for all stanchion, ladders etc. A full set of instructions, plus a FULL SIZE PLAN are included in this kit along with stainless steel propshafts, proptubes and rudder. This kit makes into a superb model of this classic British destroyer and as with all the DEANS range, has superb on the water performance.